More Singaporeans have moved to Silicon Valley (SV) for work in the last decade, according to people who have worked or are working there. And while information technology (IT) and engineering professionals are known to command higher salaries, those who move cite other reasons. "As a trend, I do see it increasing; we actually try to keep track of the numbers," said Vinnie Lauria, founding partner of tech incubator Golden Gate Ventures (GGV) which has offices in Singapore and SV. "As the Singaporean network in SV gets stronger, it encourages more folks to make the jump - something they were afraid to do earlier." Although there are no absolute numbers to show, Mark Sin, president of SingaporeConnect, a grassroots organisation that supports Singaporeans living in San Francisco, noted that he is seeing more Singaporeans at get-togethers. For James Chan, the founder-CEO of tech incubator Silicon Straits who studied and worked in SV from 2005 to 2009, said the increase was not obvious to him - until he came home. "It got a lot more obvious after I returned to Singapore and tried to wrap my head around the shortage of startup-compatible software engineers here. Those who were sufficiently exposed to Western tech media tended to aspire to leave Singapore to work at startups in SV," he said. Why SV? A major pull factor mentioned by many is surprisingly not the salary, but that there is a greater respect for tech and engineering professions there. Said Shaun Lim, who moved to SV to work at PayPal after graduating from the National University of Singapore (NUS) in 2010: "I'm a software engineer and this is arguably the best place to be for my profession. "The work here is more interesting and meaningful. Even as a junior engineer, I was able to start projects of significant size from scratch and be responsible for design and implementation. I don't believe this is something engineers in Singapore enjoy." Caleb Chao, a fellow NUS graduate and now a software engineer at Google, said he appreciated the opportunity to develop and work on established and complex IT systems there. "Large IT companies have offices in Singapore mainly for sales, marketing and technical support; development is mostly non-existent and at the very most a token presence," Mr Chao said. The Valley's open, welcoming and progressive culture is another much-talked-about pull factor. "Hours are flexible. If people want to take time off for appointments or errands, there's no need to specifically take vacation hours," Mr Sin said. "SV is an inspirational place to be in. Words like 'disrupt', 'change' and 'new technologies' are all the rage; coffee shops are always packed with entrepreneurs working on startup ideas or pitching to investors. We also get to be at the forefront of and use the latest technologies before others do," said Jenn Ng, who worked at DBS and PwC Singapore before joining SV-headquartered software company Intuit. "It's the only spot in the world that has kept up with its virtuous cycle of paying it forward, and celebrates failure as much as it celebrates successes," said Silicon Straits' Mr Chan. Agreeing, GGV's Mr Lauria said: "It's a culture that rewards risk-seekers. Most people in the Valley are from somewhere else; 52 per cent of startups are by foreign-born entrepreneurs. These are the people who aren't scared of failure and will dare take a jump into the unknown." In fact, one of the reasons why SV thrives is that it is a land of equal opportunities for immigrants, said Tan Yinglan, author of The Way of the VC and venture partner at Sequoia Capital. "Anecdotally, immigrants in SV have been entrepreneurial, motivated, hungry and eager to improve their lot in life. This creates economic dynamism in the Valley," Mr Tan noted. "It can be a pretty competitive place to be in. Analysts are expected to have a certain level of technical abilities such as coding skills. Many interns don't mind working for free, and it is still a male-dominated industry," Ms Ng pointed out. For those who work for pay, the US Bureau of Labor Statistics showed that the software engineer in SV commanded an average annual wage of US$100,049 last year. This compares with the average annual salary of $57,936 drawn by a software engineer in Singapore. Human resource consulting firm Robert Half International also ranked SV as the fourth metro area in the United States likely to offer the biggest pay raise in 2014. And while many places, including Singapore, have aspired to learn from SV's successes, observers said the island-state should not aspire to be the next SV. It has made significant strides in maturating its tech and startup ecosystem, and is better-placed to be Asia's startup hub instead. "The 'SV label' carries with it a heavy burden of expectations that Singapore is still far from meeting. A good amount of entrepreneurial talent bled out of our ecosystem after the dotcom bust. "We're only just beginning to see a revival of key elements in our ecosystem over the past two years - designers, engineers, entrepreneurs, capitalists, investments, acquisitions - yet, much remains to be done before Singapore becomes the 'SV of Asia'," said Mr Chan. Mr Sin added it is difficult for Singapore to claim the title with competition from bigger markets such as China and India. Another hindrance to the startup scene here is that most people live with their families, unlike in the US, and this inhibits entrepreneurship and risk appetite, Mr Lauria said. "The number of start-up teams that live and work out of the same apartment in SV is very high. It's amazing what you can do when you're all forced into a small apartment 24/7," he said. Mr Lim of PayPal added: "I do feel that like many things, entrepreneurship in Singapore is being driven largely from a top-down approach, and that can't be too healthy." But many cited Singapore's stable economic and political systems, high cultural acceptance, strong government funding support and startup events such as Echelon and TechVenture, as beneficial in growing its tech ecosystem. Said Steve Leonard, executive deputy chairman of Singapore's Infocomm Development Authority, at the 2013 TechVenture in September: "It is not Singapore's goal to be another version of SV. We should find something to create for ourselves." "It is great that Singaporeans are moving to SV. I anticipate that some of them will return home to start their new venture or work for local startups. But as the region's startup hub, it is good for Singapore to have close ties with the Valley," said Mr Tan. Mr Lauria, who travels frequently to look up the startup scene in each country, said: "Singapore really stood out for me because of the startup community here - it reminds me of SV in terms of openness and enthusiasm. There are few global cities as international and diverse as Singapore, and that's an asset for the startup scene. "That said, I don't think being the 'SV of Asia' is a great goal to set. 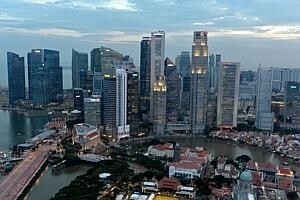 Singapore should figure out its place in the region and execute as a startup hub."